This year I kicked off our first writing project with formal letter writing. All of the Google documents referenced below are included in our free resource library. If you are not already signed up for our library, you can click here to sign up. 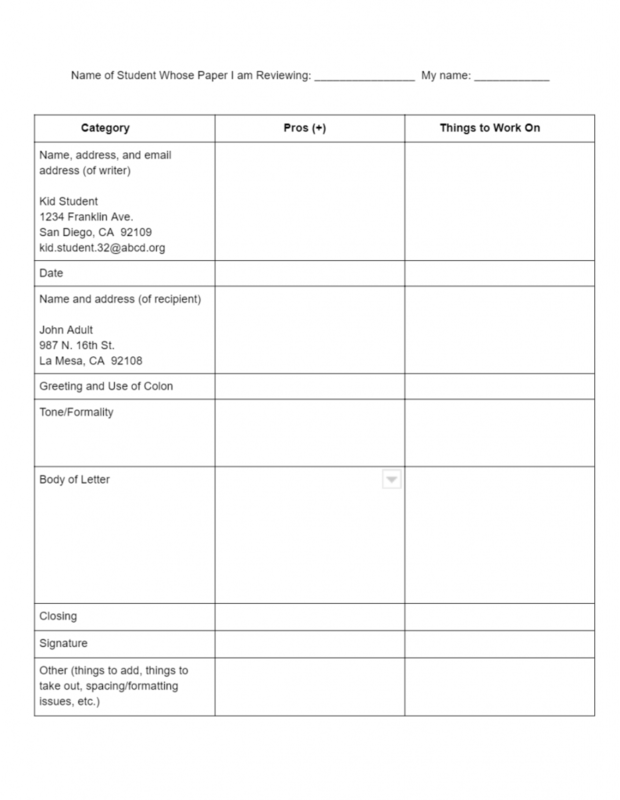 Why Teach Formal Letter Writing? Writing a letter is a fun, real-world task that is short, sweet, and easy to revise. By upper elementary and middle school, students have written tons of friendly letters. Teaching formal letters is a great way to address tone, because students will be writing to an adult audience. You can introduce a lot of other topics as well, such as the structure of a formal letter, how to use templates in Google Docs, etc. 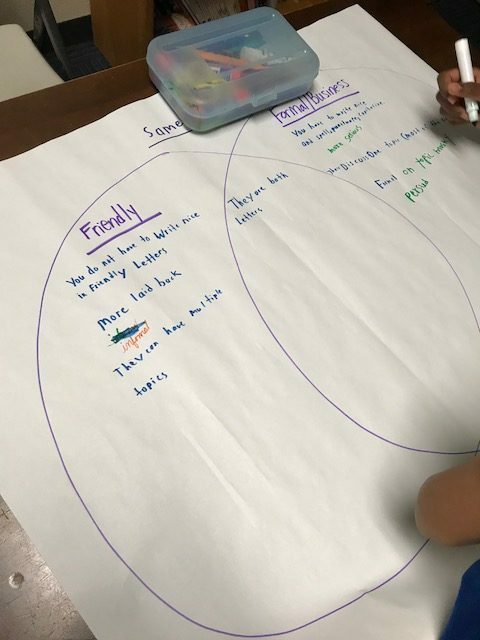 When I started this lesson with my class, I put students into groups of two or three and gave each group a large piece of chart paper. I drew a large Venn Diagram on each piece and distributed them to the groups. 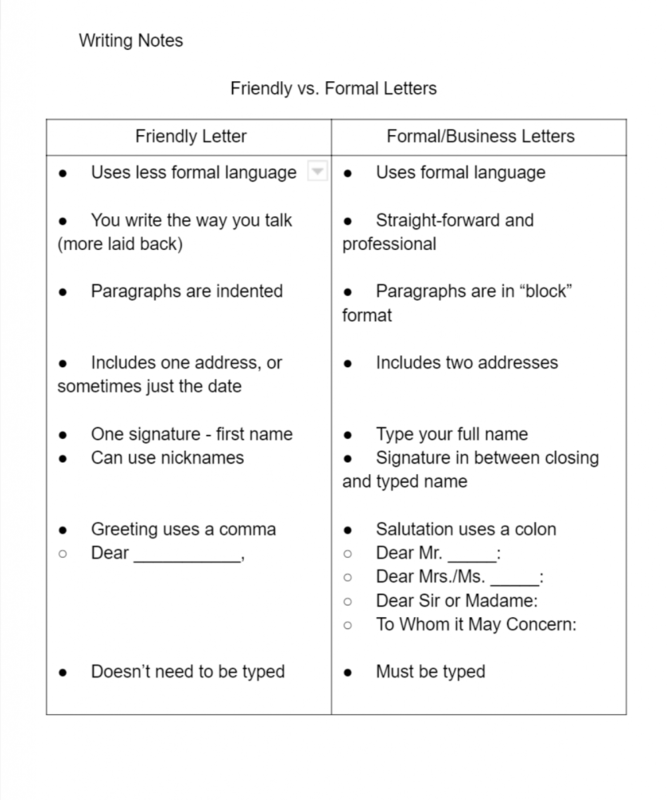 I asked students to compare formal/business letters with friendly letters to gauge how much students already knew about each type of writing. Students enjoyed using markers to fill in their charts and it was clear that we had a good starting point. They already had some good background knowledge on letter-writing. After about 10 or 15 minutes of brainstorming, we came back together as a whole group. I presented my T-chart and had students make a check mark on their large Venn Diagrams if they had a similar attribute listed. My kids had some attributes on my chart that I hadn’t even thought of, so I went ahead and made some modifications to my chart on the fly. I decided to go ahead and share these notes with the students via Google Classroom instead of having them re-write the notes in their notebooks. I didn’t think it was necessary to spend much time on this part of the task – students quickly got the point. I told my students that although there are many types of formal business letters, we would be focusing on two types: compliments and complaints. 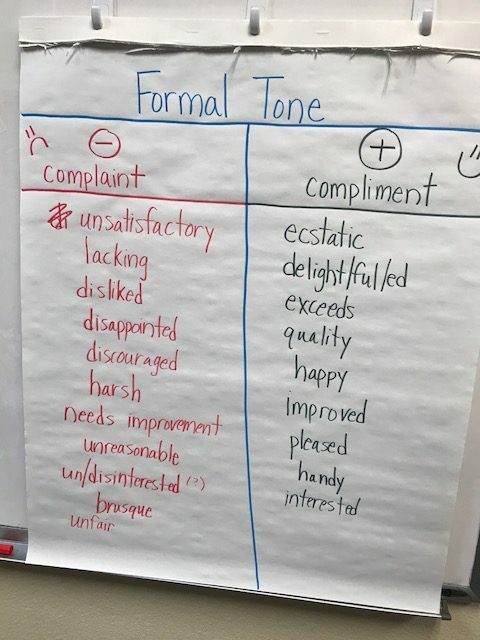 I gave some verbal examples of each type, and then as a class we brainstormed some real-life compliments and complaints that my students had – boy did they have some grievances! I wanted my students to think about real products and services that they had experienced. This was essentially a pre-writing/brainstorming activity. I also shared this document via Google Classroom. We then discussed formal tone and brainstormed some words that they might use when writing letters of complaint or letters of compliment. We left this T-chart up for the rest of the writing unit. The next day I shared a letter I had created written from “Kid Student” to “John Adult.” The kids thought the letter was hilarious and of course noticed several mistakes. I printed out the peer review graphic organizer/template and showed kids how to use the graphic organizer to critique the letter. Some sections were fine and some needed obvious work. After giving the students about 10 minutes to fill in their graphic organizer, we went over it together using the document camera. Students filled in any sections they had missed when doing this part on their own. I gave my students a quick homework assignment. They had to decide which type of letter they wanted to write (compliment or complaint). They had to figure out who they were writing the letter to, and find the address of the recipient as well as their own address. They had to give a brief summary of their compliment/complaint. When these got submitted (via Google Classroom), I couldn’t believe how many 6th and 7th graders did not know the proper way to write their home address. **You may want to have students use the school address as their return address. I did have a few parents request that we do this, and it makes sense for privacy (although I also think it is really important for students to know their own address). Do what makes sense for your setting. If I had to do it again, I would have just used the school address – not worth the headache! I shared a Google Classroom assignment with the students which included a Google Doc template (“Spearmint”) for a formal letter. 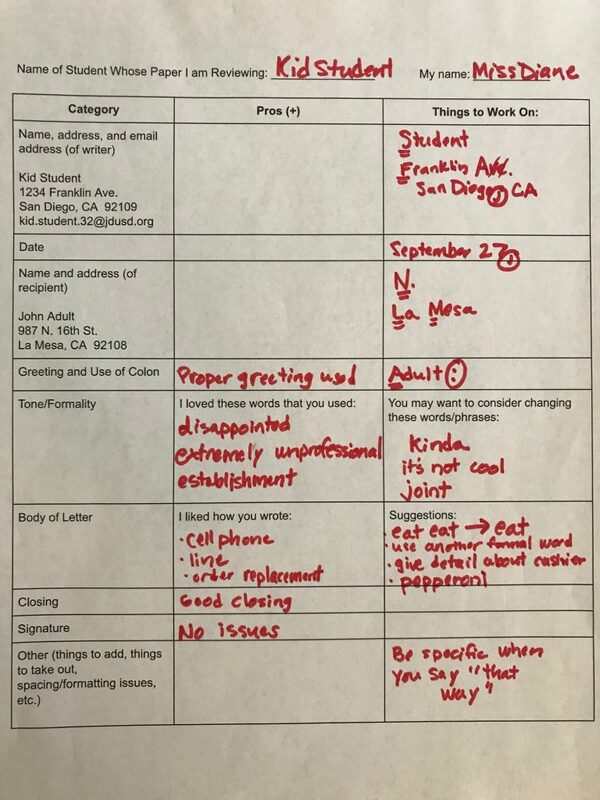 You can obviously have students make their own formal letters from scratch, but my students benefited from having a template so they knew where to put which address, the signature, etc. I had students start the rough draft in class and finish it as homework (my students are only with me for ELA for two hours a week, so we can’t always get everything finished in class). I also shared a “Rough Draft Reminders” document with the students. This document reviewed formatting, contents of formal letters, links to samples, etc. We reviewed our expectations for peer review. I made two copies of each rough draft so that students would not be waiting for something to do during the process. While you could have students share their rough drafts with each other and complete the peer review digitally, I found that having physical copies of the letter improved the quality of the peer feedback. I told my students not to write on the rough drafts themselves, but instead to describe the pros and cons on the peer review papers. I wanted student to focus on content as well as mechanics, and making students write out their feedback (vs. just correcting errors on the rough draft itself) seemed to help with this. I wanted students to get a LOT of feedback, so we spent part of two class periods doing the peer review. Most students gave feedback for 6-8 students. I stapled the peer reviews to my own feedback and passed the forms back to the kids. I pointed out that each peer noticed some different things, so it was important to read through all of the feedback when revising and editing their letters. Students took the feedback they received and created a final draft of their letter. I gave students a separate Google Classroom assignment and told them to copy and paste their rough draft onto their final draft before making revisions and edits. That way I was able to see the difference between their rough and final drafts. If you are comfortable with Google Docs, you can use “Revision History” to access both rough and final drafts. The day that students turned in their final draft I printed two copies of each letter. On one copy I taught students where to sign their name, why we use blue pen (when possible) while signing, how to fold a letter into nice-looking thirds (again, could not believe how many students didn’t know how to do this), how to address an envelope – even how to SEAL an envelope. (Miss Diane – you want me to LICK IT?!) They needed guidance with all of these steps. The students were excited that we were actually going to send the letters and agreed that if they heard from the business, they would let the class know. I graded the letters on a rubric that I found online and modified a bit to serve our purposes. This rubric had been shared and reviewed with students before they began their rough drafts. 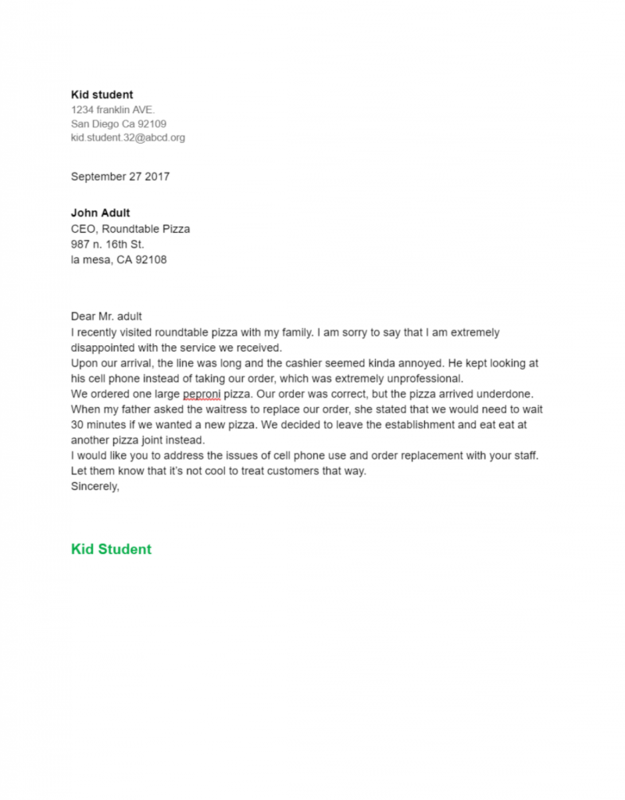 **After this entire assignment I realized that the email addresses from our school are completely blocked from people outside of our school network – we may never hear back from the majority of the businesses. 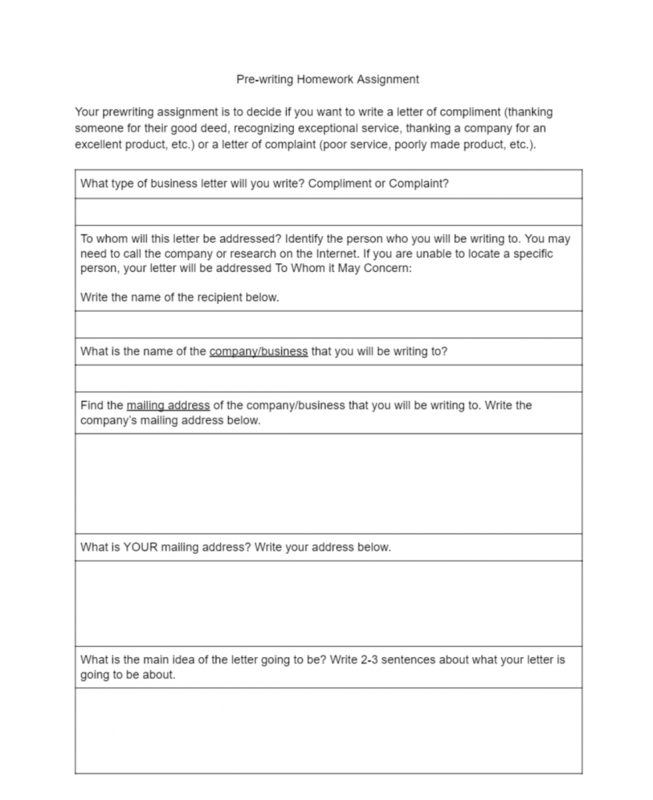 You may want to consider this if you do this assignment, because you actually want a way for businesses to get a hold of the student-authors. Ultimately, I wanted my students to know that when you have something to say, use the right tone, communicate clearly, and you may just get some results! The students had a great time with this real-world assignment. If you enjoyed reading this post you may want to check out this one on teaching your students email etiquette, another important real-world writing task!